Pinco Genovese was typical of the ships used by the Ligurian Navy in the Mediterranean from the middle of the 18th to the early 19th century. With a capacity of 300 tons, the vessel was set up with a three-masted lateen sail format and this was only replaced in bad weather with a square sail system. The huge expanses of sails allowed them to out-run the enemy and a battery of cannon often assured victory in naval conflict.To enhance the speed of the Pinco, goods were also covered, and even stowed away on board (particularly the barrels). The Pinco only travelled in the Mediterranean and often close to the coast. The mizzen mast was moveable to the left of mid-line mast set-up to allow maximum use of the tiller. With good weather and favourable wind, the Pinco was a highly manoeuvrable and fast ship. Often the Ligurian pirates armed themselves with guns to attack the British ships that ventured into the Mediterranean through the Straits of Gibraltar. 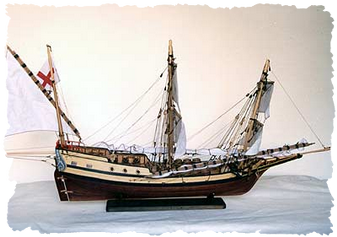 The following photos are an example of how a finished model of the Pinco Genovese can look.